Find us online and in print through articles written by students, local newspapers, the Catholic Herald, and more. Doug and Susan McKenna served the students of the Catholic Campus Ministry from 1996-2014 in many ways. The Arlington Catholic Herald highlights their 26 years of service to the students in a May 2018 article. The Arlington Catholic Herald's coverage of the second annual Mass Under the Lights, a special mass dedicated to the student athletes at the University of Mary Washington. Rev. Mr. James Waalkes is a UMW Alumni who experienced the Catholic Campus Ministry as a freshman. He entered the seminary in 2013 and is a transitional deacon preparing to become a priest in the coming year. Ashleigh Kassock of the Arlington Catholic Herald writes about the dedication of the Catholic Campus Ministry building to St. John Bosco and the campus ministry's Third Annual Eucharistic Procession. Blue and Grey Press, UMW's Student Newspaper, covers the Catholic Campus Ministry's third annual "Eucharistic Procession" which was lead by Bishop Michael Burbidge. Article written by Elena La Dolcetta and photo taken by Alexandra Cooper. The Free Lance Star, local Fredericksburg Newspaper, covers the Catholic Campus Ministry's first "Mass Under the Lights," an event designed to show support ant outreach to UMW's student Atheletes and their coaches. Article written by Amanda Vicinanzo and photo taken by Robert A. Martin. Rachel Manning, a UMW student and candidate in the Catholic Campus Ministry's RCIA class, shares a reflection she wrote about encountering God through prayer with the readers of Catholic Connect. Alexandra Cooper, shares her experience of being a Catholic Freshman at Mary Washington University on her blog Adventures of a Catholic College Girl. 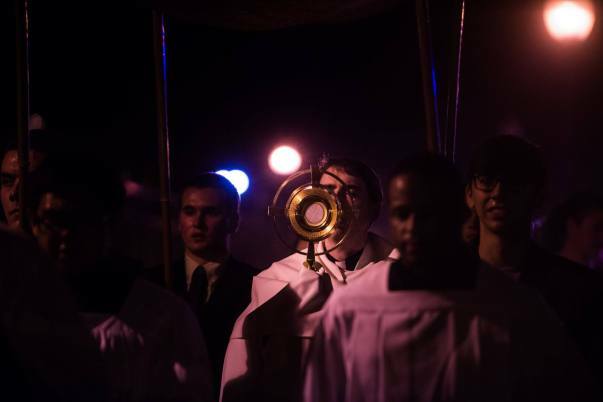 Mary Stachyra Lopez of the Arlington Catholic Herald covers the First Annual Eucharistic Procession and All Night Adoration on Mary Washington's Campus.